2203 JMP Master Volume Lead [1975-1981], Tube Guitar Amp Head from Marshall in the JMP series. "Marshall JMP mkII 50 watt combo"
The Marshall JMP was the go-to amp if you were a rock or metal musician in the seventies and early eighties. Everyone from Thin Lizzy to Iron Maiden used them and the picture of a wall of Marshalls sitting behind an arena stage is something every aspiring rocker dreams of. This firebreather used EL34s in the power section to deliver 100 watts of British crunch. It is a single channel amp with standard bass, middle, treble, presence, and dual volume controls. After 1975 these amps were changed to the gain and master volume setup to appease the players who needed that distorted tone but couldn't dime a 100 watt head. There's no reverb or effects loop on this amp unless it is modified. These amps sound killer for classic rock or hard rock tones. The thing is, even the Master Volume model JMP is still an extremely loud amplifier. You either need to be in a soundproof room or have a good power attenuator to get the cranked tone at a more manageable volume level. The controls are pretty straightforward and act as intended. I find they can get kinda harsh when turned up so I prefer to keep the treble and presence lower when I've turned these amps up to stage volumes. This amp sounds killer for that raunchy British powered rock style used by so many bands back in the day. I would say it is a bit of a one trick pony but it does that trick very well. These amps get gain from volume, so naturally it will sound better as the volume is turned up, definitely. It sounds great with a variety of guitars, but the combination of this amp with a Gibson or other mahogany humbucker loaded guitar is awesome. Definitely the ticket for rock and early metal tones with that classic EL34 bite. These amps also make great mod platforms to be turned into high gain monsters too. 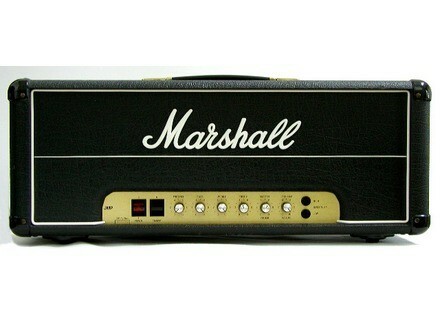 All in all I think the Marshall JMP is a great sounding and ultimately one of the classic Marshall amps of days gone by. They can be had for about a grand used which is a good price considering how good they sound and how iconic they are. You might want to budget for an attenuator to really get the most out of one of these, but when you do, look out!